Discover forgotten divinatory skills, and learn to read the Tarot with confidence. 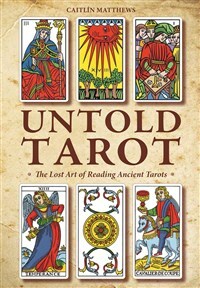 Not just another Tarot book, Untold Tarot presents historic styles of reading little known in the modern era. It teaches traditional ways of reading used for pre-twentieth-century decks, drawing upon older cartomantic arts such as blending and pairing cards, reading lines, and following "line of sight" to piece together untold stories according to the direction in which the characters are facing. The time to rediscover these lost skills is ripe, and the practical and personal approach presented here empowers you to read in your own fluid style and develop a full palette of skills. The book also includes a selection of card spreads drawn from traditional French and Italian sources, plus methods of reading cards based on the author's own extensive research. Caitlín Matthews's books, courses, and events may be seen at www.hallowquest.org.uk. Her divination and myth blog is http://caitlin-matthews.blogspot.co.uk.